The New York State Berry Growers Association (NYSBGA) is partnering with the experts art Cornell CCE to bring you the region's first-ever blueberry intensive, an in-depth look at blueberry growing techniques, pests and diseases, marketing and other business topics, and an afternoon demonstration on working farms. Site selection and preparation is one of the most important aspects in terms of long-term success, as it will impact overall plant growth, pest pressure, weed management, and fruit quality. 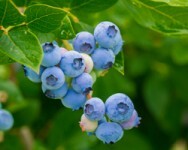 Dr. Cox will outline the major diseases that blueberry growers in Western NY need to be aware of. He'll discuss the most successful management strategies, including conventional fungicide programs and organically appropriate approaches. Dr. Stockton will discuss major blueberry insect pests including cranberry and cherry fruit worm, blueberry maggot and Spotted Wing Drosophila. Pests like scale that may increasing due to more aggressive spray programs will also be discussed. Dr. Carroll will lead growers through a hands-on discussion of the NEWA pest models that will allow growers to better time and hopefully reduce sprays while still getting good control of pests. Farm to school, value added, nutraceuticals, organic wholesale--market options are plentiful for blueberries. 11:30 am-12:15 pm: Berry crops profitability tool—knowledge is power! Feeding blueberries is an important and challenging aspect of blueberry culture. Acidity of soil and water plays a huge role, so a discussion about acidification will be part of the presentation. Plants in good vigor are much better at resisting insect and disease pests. One method of preserving fruit quality in harvested berries that may have had pressure from SWD is immediate and adequate chilling. Growers need to understand the importance of removing field heat and how to do it quickly with forced air cooling. Modified atmosphere packaging will also be discussed along with helpful tools like a CoolBot. Like nutrition, good cultural care is important for an overall vigorous and pest durable plant. Pruning is as the plant moves through its juvenile period so that will be described. Examining existing blueberries in the early season is the first thing to do for pest control. Looking for scale, mummyberry apothecia, and gall's while plants are just breaking dormancy is crucial. Weed populations will begin to be evident as well. Herbicides are often used in the early pre-bud break time period for best results. Adding mulch should be done in the spring. This hands-on opportunity will provide continued discussion of the 2:30 afternoon session. We'll address the differences in cultivars and pruning approaches, which will become more obvious as we look at plants. The use of a pneumatic pruner will be demonstrated, as well as more traditional tools. Attendees will receive a resource packet of presenter handouts and other valuable information that they can refer to season after season. In addition, they will have the opportunity to ask the experts questions that are specific to their own farms.